BBC News: "Israel backs East Jerusalem homes"
An Israeli planning committee has pushed forward plans for 600 new homes in mainly Arab occupied East Jerusalem. Continue reading BBC News: "Israel backs East Jerusalem homes". Continue reading Ynet: "Goldstein legacy continues". Ariel Sharon was considered the godfather of the Israeli settlements movement. His ardent support of settlements construction and the legitimacy he lent to the strategic argument for settlements as a means of enhancing Israeli security were vital to the success of the enterprise, particularly in the years after he left the Israeli military for politics. Sharon's basic argument revolved around security. During my time as U.S. Ambassador to Israel, Sharon would often hold forth on the rationale for and his own role in the planning of new settlements. Continue reading Behind the Settlements by Daniel Kurtzer. Washington, DC - Americans for Peace Now today launched a new campaign, urging Americans who care about Israel's future to raise their voice against political violence and intolerance in Israel. The campaign, Stop the Violence, Stop the Hate, features a new interactive web page that combines education with activism. Continue reading New Campaign Against Violence and Intolerance in Israel. 3. APN and the NYT's Roger Cohen Agree: Target Iran's Censors! Continue reading APN Legislative Round-Up for the Week Ending February 5, 19, and 26, 2010. Video footage (with English subtitles) from Saturday's demonstration is now available. The Diaspora Affairs and Information Ministry recently launched a web site that the public is asked to visit in order to learn how to explain Israel overseas. The site's launching is being accompanied by an expensive, large-scale ad campaign, but a closer look at the site and its contents raises the worrying conclusion that the information minister has chosen to use the resources of his ministry to promote extreme right wing political positions under the guise of global PR. Continue reading Yedioth Ahronoth: "Everything But PR" by Peace Now's Yariv Oppenheimer. Israel is going through a dark time, marked by increased settler violence, intensified incitement against pro-peace leaders and causes in Israel, and vicious demonization of pro-peace, pro-democracy forces. Enough is enough. Stand for peace. Condemn the use of violence by settlers. JTA: "Can Iran's democracy clock outpace its nuclear clock?" WASHINGTON (JTA) -- Iran watchers keep two clocks: One counts down to a nuclear Iran, the other counts down to a democratic Iran. Neither clock is guaranteed to keep ticking all the way down. Continue reading JTA: "Can Iran's democracy clock outpace its nuclear clock?". The Israel Defense Forces, the country's binding institution, recently set up a unit to combat, not Palestinian terror or a regional threat, but violence by the country's own citizens - specifically Jewish settlers in the West Bank against both Palestinians and fellow Israeli Jews. Continue reading Washington Jewish Week: "Standing things on their head" by APN Chair Martin Bresler. Baker on Obama's Iran policy thus far: "I think it's too soon to say everything has failed. I don't -- I think you keep doing what you're doing. In other words, I think what you need to do is keep pushing for stronger sanctions and keep talking to or being ready to talk to the Iranian leadership, if they're willing to talk. Those things -- and support the reformers in the streets. Those three things. They're not mutually exclusive. It's exactly what we did for 40 years with the Soviet Union. We talked to them about nuclear -- we negotiated arms control agreements. We supported the dissidents in the Soviet Union. We worked hard on Soviet-Jewish emigres to get them the right to leave. We met with dissidents when we would go over there as -- as Secretary of State. And so there's no reason why we can't do all three of those things and continue to do them." Continue reading Wise Words on Iran and Israeli-Palestinian peace efforts, from James Baker on CNN this week. Continue reading Middle East Peace Report- February 22, 2010. Over a thousand Peace Now activists and supporters gathered in Tel Aviv Saturday for a satirical demonstration to assert the notion that Prime Minister Benjamin Netanyahu and his Defense Minister Ehud Barak's peace rhetoric is not backed up by actions. 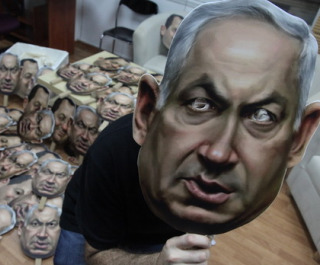 In the masquerade tradition of the Jewish holiday of Purim, which is celebrated this week, demonstrators were handed masks of Netanyahu and Barak, and placards referring to the Netanyahu government's make-believe peace overtures. Continue reading Peace Now "Masquerade Carnival" Demonstration in Tel Aviv. Alpher answers questions about the assassination of Hamas militant Mahmoud al-Mabhouh. Q. How does the Mabhouh assassination in Dubai affect Israel's overall security? A. In many ways, both positively and negatively. The murder in his Dubai hotel room of Hamas militant Mahmoud al-Mabhouh last month and the sensational revelations that have followed focus on the death of the man allegedly in charge of military contacts between Hamas and Iran. Continue reading Hard Questions, Tough Answers with Yossi Alpher- February 22, 2010. 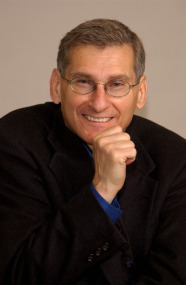 Dr. Mark Rosenblum, founder of Americans for Peace Now and Director of the Jewish Studies Program at Queens College, will kick off the Jewish Federation of Sarasota-Manatee's "Meshuganah March" programming with a lecture on the Politics of Isreali-Palestinian Peace. This event, part of the Heller Israel Advocacy Initiative, is co-sponsored by the local chapter of Americans for Peace Now. The lecture is free and open to the community. When you've spent years working to bring peace to Israel and to build support for that idea, watching someone else kick it around like a political football is just too much to swallow without speaking up. Continue reading Jerusalem Post: "Enough is enough" by APN's Lara Friedman & J Street's Hadar Susskind. Ynet Editorial: "PR website: Justifying state or government?" We agree with Ministry of Information that we don't all ride camels, but political issues are more controversial. Settlements not obstacle to peace? Golan Heights crucial for security? Whose opinions are reflected by the website? Continue reading Ynet Editorial: "PR website: Justifying state or government?". Ynet & Jerusalem Post Articles on Peace Now's 'masquerade carnival' to protest gov't"
Hundreds of people gathered outside the Tel Aviv Cinematheque Saturday evening in protest of the fact that construction in the West Bank settlements has not been completely halted despite the government's decision on a 10-month construction moratorium. 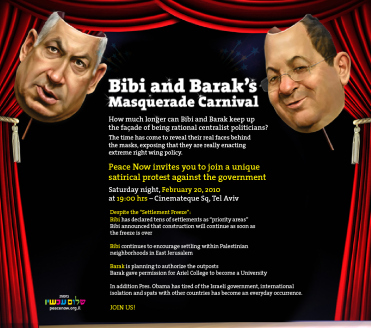 Continue reading Ynet & Jerusalem Post Articles on Peace Now's 'masquerade carnival' to protest gov't". On Saturday night hundreds of Peace Now activists will converge in Tel Aviv to make an important statement: Benjamin Netanyahu and Ehud Barak may talk a lot about peace, but -- when it comes to actions -- they are implementing an anti-peace agenda. 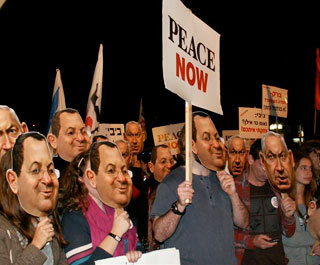 Continue reading Peace Now demo reveals gap between Netanyahu's rhetoric and actions. Sheikh Jarrah has been in the news a lot lately - settlers taking over houses, weekly protests against the takeovers, harsh action by the police against the protesters, etc.. But it is becoming clear that the settler takeover of the homes in Sheikh Jarrah is just tip of the iceberg. Recent developments suggest that the settlers and their supporters are working to apply the tactics they have successfully used in the takeover of Silwan (and other areas of the Old City's historic basin) in Sheikh Jarrah. This means expanding the settler presence and settler dominance over the area not just through the takeover of homes, but through seizing control of the public domain (for the benefit of the settlers). It also means working to shift the Israeli (and international Jewish) public perception of the area in order to make this Palestinian neighborhood part of the so-called Jewish "consensus" -- an area viewed as being home to core Jewish religious and historic equities that must never be left under Palestinian control. What we are seeing here is the Silwan-ization of Sheikh Jarrah. Continue reading The Silwan-ization of Sheikh Jarrah. On Saturday night hundreds of Peace Now activists will converge in Tel Aviv to make an important statement: Benjamin Netanyahu and Ehud Barak may talk a lot about peace, but - when it comes to actions - they are implementing an anti-peace agenda. Continue reading Peace Now to Bibi & Barak: Stop Pretending. The RJC (and SWC) tell Members of Congress: Stop Criticizing Israel over Gaza! The Republican Jewish Coalition has had it with people criticizing Israel about Gaza. That is the gist of the RJC's latest partisan, grand-standing screed, published today in the Jerusalem Post, opposite an op-ed by myself and my J Street colleague Hadar Susskind. The RJC's logic is the latest example of the kind of tactics Hadar and I are talking about in our article: "No American - Jewish, Muslim or Christian, Democrat or Republican - who recognizes the security benefit to Israel in ending rather than enabling Hamas' monopoly over basic goods in Gaza, who sees that furthering a humanitarian crisis does not equate to fighting terrorism, and who cares for the future of children in the Middle East, Israeli and Palestinian, should let anyone use fear and smear tactics for their own partisan benefit." And as Hadar and I point out: "There are real threats to Israel. There really are people out there who don't support Israel as a Jewish democratic homeland. We don't need to invent opposition to Israel and we certainly don't need to push people who are supportive of Israel away from us by calling them 'anti-Israel' every time someone expresses either concern for Palestinians or opposition to a particular Israeli government position." Shame on the RJC for this further shameless partisan grandstanding at the expense of Israel. Continue reading The RJC (and SWC) tell Members of Congress: Stop Criticizing Israel over Gaza!. Once again, even Americans can not stand up to a small group of settlers, who show - more often than not - that they have the last word on what takes place in the West Bank. This time, a small group of settlers insisted, and succeeded, to squash a plan for building a hospital for Palestinian children at "Oush Grab" ("the Crow's Nest") east of Bethlehem. 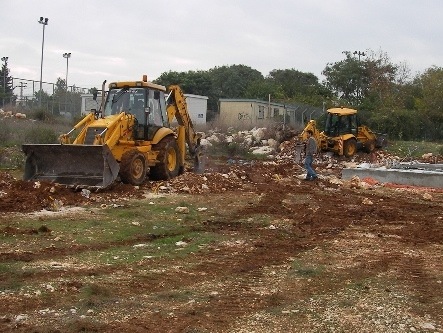 Continue reading Huffington Post: "How Settlers Prevented The Construction of a Palestinian Hospital" By Peace Now's Hagit Ofran. JTA: "Israel wants tourists to do PR"
Even if you think this effort is a smart move, Ori Nir, spokesman for Americans For Peace Now, says the strategy is being carried out atrociously. Continue reading JTA: "Israel wants tourists to do PR". I thought about it for a while. I came to the conclusion that it's not so funny. On Tuesday, Israel's Deputy Foreign Minister Danny Ayalon essentially called J Street an organization of liars. Yesterday, the Israeli media reported that Ayalon intervened to prevent a Congressional delegation from meeting with representatives of the Israeli Foreign Ministry and other senior governmental officials. As a political analyst, I understand that Ayalon wants headlines that appeal to his hard-line constituency. Sooner or later he will have to face re-election and to fight off other politicos eager for his senior rank within his party's Knesset list. Headlines like this probably help his political career. Continue reading To laugh or to cry?. Those of us who oppose efforts to impose "crippling sanctions" on the Iranian people - an approach supported by many in Congress (and most of the Jewish community) are often belligerently asked: "if you don't support these sanctions, what is your alternative?" The implication being that if we can't propose another course of action then we must support the crippling sanctions, even if nearly everyone agrees that such sanctions won't work and will likely prove counterproductive. This is of course a silly argument - imagine two doctors arguing about how to treat a patient: Doctor 1: "We've tried everything we can think of and he's not getting better, so I propose we try radiation." Doctor 2: "Are you nuts? Given his condition, all medical science points to the fact that radiation won't do anything to help him and will almost certainly make him worse" Doctor 1: "Well, unless you have a better idea you have no choice but to accept my recommendation." Doctor 2: "Where did you get your medical degree??" To which I think most people would reply: great idea! Someone in Congress should get working on this! Continue reading NYT's Roger Cohen and APN agree: Target Iran's Censors. Last week, I wrote a blog post about the absurdity of drafting Israeli tourists to become "hasbara (propaganda) ambassadors" for Israel. Yesterday, Israel's Hasbara Ministry launched a new web site, in Hebrew, to supply the Israeli traveler with ammunition against defamers of Israel abroad. As an Israeli, I find this site offensive. Continue reading It's the Policy, Stupid!. The Israeli High Court responded favorably to a Peace Now petition about following through on the mandated removal of two West Bank outposts. Ha'aretz: "High Court orders Israel to speed up outpost demolitions"
Ynet: "State on illegal outpost: Delay in relocating settlers"
Continue reading Articles on High Court Order to Speed Outpost Demolition. CONTACT: Ori Nir - (202) 408-9898; onir@peacenow.org Washington, DC -Americans for Peace Now today welcomed President Obama's appointment of Robert Stephen Ford as ambassador to Syria and urged the Senate to promptly approve the appointment. Continue reading APN Welcomes Appointment of Ambassador to Syria. Acting on a Peace Now petition, Israel's Supreme Court demanded yesterday that the Israeli government submit a detailed timetable for razing 16 structures in two West Bank settlement outposts. The structures were built in violation of Israeli law. Some of the land in these outposts is listed in Israeli-government documents as Palestinian-owned, private property. None of the land is owned by the squatters. Continue reading Thou shall not steal. Continue reading Middle East Peace Report- February 16, 2010. Violations of the West Bank settlement construction freeze have occurred in at least 34 settlements, a quarter of the total. Below, see footage captured by Peace Now of stealth construction of foundations during the night in the settlement of Talmon. AFP: "Quarter of Israeli settlements violate building ban: group"
Ha'aretz: "U.S. denies dropping demand for Israel settlement freeze"
Reuters: "Abbas seeks U.S. answers before talking to Israel"
Continue reading More Articles on Settlement Freeze Violations. Jerusalem Post: "29 settlements defy freeze order"
Ynet: "Defense Ministry: Building in 29 settlements despite freeze"
BBC News: "Israeli settlers 'still building'"
JTA: "Many settlements violating building freeze, Israel says"
Ha'aretz: "Defense Ministry reveals West Bank settlement freeze abuses"
Continue reading Articles on Violations of Settlement Freeze. Alpher answers questions about U.S. mediation in indirect Israeli-Palestinian peace talks, Swiss back channel talks on Iranian nuclear issues, and Palestinian Authority PM Salam Fayyad's state-building plan. Continue reading Hard Questions, Tough Answers with Yossi Alpher- February 15, 2010. Israel's Ministry of Information (yes, there is such a thing - for the first time it is a full-fledged cabinet portfolio) recently commissioned a public opinion survey among Israeli Jews (yes, Jews only). Ninety-one percent, according to the poll, said that Israel has a "severe" or "very severe" image problem overseas. Eighty percent said that Israel is perceived as an "aggressive country" and 30 percent said that Israel is perceived as an "unfriendly country." Continue reading Policy and Propaganda. Alpher answers questions on the current wave of political intolerance directed at the left in Israel, and what to do about it. Continue reading Hard Questions, Tough Answers with Yossi Alpher- February 8, 2010. Here is a list of the signers of the Congressional letter on Gaza. Continue reading Signers of Congressional letter on Gaza. 54 members of Congress sent a letter to President Obama last week. The letter called on him to take action to address the dire humanitarian situation in the Gaza Strip. Peace and security for Israel are inextricably linked to the welfare of the Palestinian public. This letter marks an important achievement. It demonstrates a substantial constituency in Washington that wants to see the president take action. Click here to read the full text of the Congressional letter. Continue reading Help Israel deal with Gaza crisis. APN Rabin Event - Levin Grandchildren Sing "Shir L'Shalom"
Accompanied by Rabbi Neil Comess-Daniels and Cantor Ken Cohen of Beth Shir Sholom of Santa Monica, the grandchildren of Yitzhak Rabin Peace Award Recipient Irwin Levin speak about the life of the former Israeli Prime Minister and then sing the song "Shir L'Shalom". This concluded the Americans for Peace Now Yitzhak Rabin Peace Award Luncheon on Sunday, January 24, 2010. Continue reading APN Rabin Event - Levin Grandchildren Sing "Shir L'Shalom". APN, together with six other US-based Middle East peace organizations, today sent a letter to President Obama, urging him to ask Israel to lift its Gaza closure in order to remove a "serious obstacle to restoring hope and making peace" in the region. Continue reading APN, US Peace Groups to Obama: Ask Israel to Lift Gaza Closure. Something is terribly wrong in the Jewish community when a prominent man, who has spent a lifetime shaping legal arguments of the highest caliber, resorts to hateful name-calling against a fellow Jew and a pillar of the international legal community. That is what Alan Dershowitz did. Continue reading Words that hurt. As Americans have learned from the Daily Show, sometimes satire can be the best way to take the political temperature of a country. Last month, Eretz Nehederet -- a prime-time satire show broadcast by Israel Television Channel Two -- produced a series of skits about settlers holding Israel's defense forces hostage. Continue reading Israel held hostage. Ynet: "Barkat says will seal Beit Yehonatan, 200 Arab homes"
Mayor to implement sealing orders on illegal structures built by both Jews and Arabs in east Jerusalem...The Peace Now movement said that "the Jerusalem mayor has turned into a collaborator with Israel's most extreme right-wing organizations." Continue reading Ynet: "Barkat says will seal Beit Yehonatan, 200 Arab homes". Forward: "Congressional Letter To End Gaza Blockade Splits Activists"
Published February 03, 2010, issue of February 12, 2010. Washington -- A congressional letter calling on the United States to press for the lifting of the blockades imposed by Israel and Egypt on Gaza has sparked controversy within the Jewish community. Picture: Reps. Jim McDermott (left) and Keith Ellison sponsored effort to ease blockade on movement of civilian goods. Continue reading Forward: "Congressional Letter To End Gaza Blockade Splits Activists". Alpher answers questions about President Obama's State of the Union address, the publication of the Palestinian Authority's "Priorities for 2010" document, and Hamas' fortunes as semi-sovereign rulers in Gaza. Continue reading Hard Questions, Tough Answers with Yossi Alpher- February 1, 2010. Continue reading Middle East Peace Report- February 1, 2010. Didn't G-d Give Israel to the Jewish People? They say:The Torah explicitly says that G-d gave Israel to the Jewish people. It is our birthright. The birth of the modern state of Israel in 1948 is the fulfillment of this right. No other national or religious claims are relevant. Those who ask Jews to give up an inch of our G-d-given trust, in the na‹ve hope of achieving "peace" with our enemies, fail to appreciate this birthright and the obligations it entails. Continue reading The Heart of the Matter. They say: The Palestinian demand for the "right of return" is nothing more than a veiled call for the destruction of Israel. The fact that Palestinian leaders and negotiators, including from the so-called "moderate" parties, will not drop this demand proves that the Palestinians don't really want peace and a two-state solution, but really want a one-state solution - Palestine, located on all the land between the Jordan River and the Mediterranean Sea. Continue reading Palestinian (and Jewish) Refugees and the Palestinian Right of Return. Even an Inch of Jerusalem? They say: Jerusalem is the heart and soul of the Jewish people. Israel cannot give up any of this holy city to the Arabs, especially in light of history, where under Arab regimes Jews were denied access to our most important holy sites, and our holy sites were abused and damaged. Continue reading Biblical Claims to the Land: How Can Israel Give Up. How can Israel be expected to leave Hebron? They say: Hebron was the first capital of the Jewish state under King David, and it is the site of the tomb of the patriarchs and matriarchs of the Jewish people - Abraham, Isaac, Jacob, Sarah, Rebecca, and Leah. Hebron cannot be given to the Arabs because, fundamentally, it belongs to the Jews. Continue reading Biblical Claims to the land. Why shouldn't Israelis/Jews live in the Bank? They say: Arabs live in Israel, so why can't Jews live in the West Bank? To accept this is to enforce a double-standard that demands tolerance from Israelis but accepts Arab anti-Semitism. A Smart Move or a Strategic Blunder? They say: In 2005, Israel gave Gaza to the Palestinians. Israel gave up every inch of the land, uprooting thousands of settlers from their homes and fields and relinquishing strategically vital territory like the Philadelphi Corridor. Rather than getting peace in return for this concession, Israel got more terror: Hamas control of Gaza, Qassams raining down on southern Israel, and the kidnapping of Gilad Shalit. The Gaza experience proves that "land for peace" doesn't work. Continue reading Withdrawal from Gaza. How is the dismantling of some checkpoints and roadblocks in Israel's interest, and not just opening the door for more terrorism? They say: The Left demands that checkpoints and roadblocks be dismantled. This is irresponsible. Checkpoints are not about punishing the Palestinians but about saving Israeli lives. It is Palestinian terrorism that makes the checkpoints necessary. When terrorism stops, checkpoints can come down. Until then, removing them now only opens the door for more terrorism. Continue reading Dismantling Checkpoints and Roadblocks. Will removing West Bank settlements and outposts satisfy the Arabs and bring peace? They say: Removing settlements and outposts from the West Bank will not satisfy the Arabs and bring peace. The Arabs regard even Tel Aviv as "occupied territory" and aspire to "liberate" all of Palestine. Continue reading Removing West Bank Settlements. that the UN can play a constructive role in resolving the Israeli-Arab conflict? They say: The UN is stacked against Israel. From the "Zionism is racism" resolution to the seemingly unending gratuitous criticism of Israel, to the numerous UN bodies dedicated to Palestinian rights, it is clear that at best the UN is NOT an honest broker in this conflict and at worst the UN is anti-Israel. Why, then, does the Left seem to believe that the UN can play a constructive role in resolving the Israeli-Arab conflict? Continue reading Why does the "Left" seem to believe. Washington, DC - Israel's Peace Now movement and Americans for Peace Now strongly condemn the vicious attacks on the New Israel Fund, on its Chair, Naomi Chazan, and on the NIF's grantee organizations who are quoted in the United Nations' fact-finding mission's report on last year's Gaza war. Continue reading APN and Peace Now Condemn Attacks on NIF. when most Israelis adamantly oppose ceding the Golan Heights? They say: Polls show that most Israelis object to ceding the entire Golan Heights to Syria, even in return for a full peace accord. Peace Now supports negotiations with Syria, knowing that the return of the entire Golan Heights is a core Syrian demand. How can Peace Now support something that most Israelis adamantly oppose? Continue reading How can Peace Now support negotations with Syria. of the refugee problem and open the door for resettling these Palestinians immediately in the host countries? They say: If you really care about peace and about the Palestinian people, why aren't you demanding that UNRWA - which has been accused of supporting terrorists - be disbanded?Wouldn't that end the perpetuation of the refugee problem and open the door for resettling these Palestinians immediately in the host countries? Continue reading Wouldn't disbanding UNRWA end the perpetuation. (Abu Mazen), who has clearly not sworn off violence against Israel, is a partner for Israel? They say: How can you say that Palestinian Authority President Mahmoud Abbas is a "partner" for peace? He may sound good when he talks to left-wing Americans, but he shows his true colors when he talks to other Arabs: Earlier this year he told the Jordanian daily "al-Dustur" that he was currently opposed to armed struggle against Israel, but that "maybe in the future things will be different." How can you seriously argue that this man, who has clearly not sworn off violence against Israel, is a partner for Israel? Continue reading How can you seriously argue that Mahmoud Abbas. why aren't they also leading the calls on Israel to use every tool possible to root out the terrorists and dismantle the terrorist infrastructure that supports them? They say: The Left always wants negotiations, talks, and ceasefires, and criticizes Israel when it takes strong action against terrorists. If the Left is serious about talking to "moderate" Palestinians, why isn't it leading the calls on Israel to use every tool possible - like major military force, detentions and arrests, home demolitions, targeted killings, stronger economic pressure, and whatever else Israeli security strategists can come up with - to root out the terrorists and dismantle the terrorist infrastructure that supports them?? Continue reading If those on the "Left" want negotiations. as "occupied" when they never belonged to any other sovereign nation and Israel gained control of them as an outcome of a war forced on them? They say: Why does the Left insist on referring to "Occupied Territories?" Judea and Samaria (or as the Left would say, the West Bank and Gaza) cannot be "occupied" because they never belonged to any other sovereign nation. Israel gained control of these areas as an outcome of a war that was forced on Israel by the Arabs. And now the Arabs have the temerity to blame Israel for not handing them back to the people who attacked it. This is ridiculous. Israel has every right to hold onto this land; if someone disagrees with that, then this makes the status of these areas "disputed." Continue reading How can the West Bank and Gaza be characterized. in supporting this Palestinian leadership when the Palestinians themselves are not doing their share? They say: Claiming political impotence has become part of a strategy of the Palestinian leadership in order to evade accountability and responsibility. This is a ruse. Abbas and his cronies have the resources and ability to govern. What they lack is the willingness and determination to do so. Instead, they blame Israel and demand more and more political and security concessions, and they beg for more and more economic handouts. Why should Israel and the international community invest in supporting this Palestinian leadership and trying to create a Palestinian state when the Palestinians themselves are not doing their share? Continue reading Why should Israel and the international community invest. Peace Now and APN very seldom issue joint statements. We took this unusual step today to react to the shocking attacks on the New Israel Fund. These attacks include newspaper and internet ads that resemble images from the darkest times in Jewish history. The attack on NIF concerns all progressive Israelis and their supporters in the United States. Here is the text of the press release. Continue reading Peace Now and APN Condemn Attacks on NIF . protects Israel from another "Hamastan" like exists in Gaza. Withdrawal would put Israelis in jeopardy. They say: The only thing preventing the West Bank from looking like Gaza is the presence of the Israeli military in these territories. Israeli control of the West Bank is actually the only way to protect Israel from another "Hamastan," on its east. An Israeli withdrawal under any circumstances would put Israelis in jeopardy. So why does APN constantly demand an end to the "occupation" and an Israeli withdrawal from the West Bank? Continue reading The Israeli military in the West Bank. Sacred Site or Fabricated Excuse for Israel Haters? They say: Arab opposition to this project is fake. Arabs never cared about the site until now, and now it is just an excuse for Israel haters - like the Islamic Movement of Israel, an organization that is anti-Zionist, which has contacts with militant Islamists worldwide, including with Hamas - to attack and try to embarrass Israel. By opposing the project, Americans for Peace Now is siding with anti-Semites, Israel haters, and terrorists. Continue reading The Mamilla Cemetery.